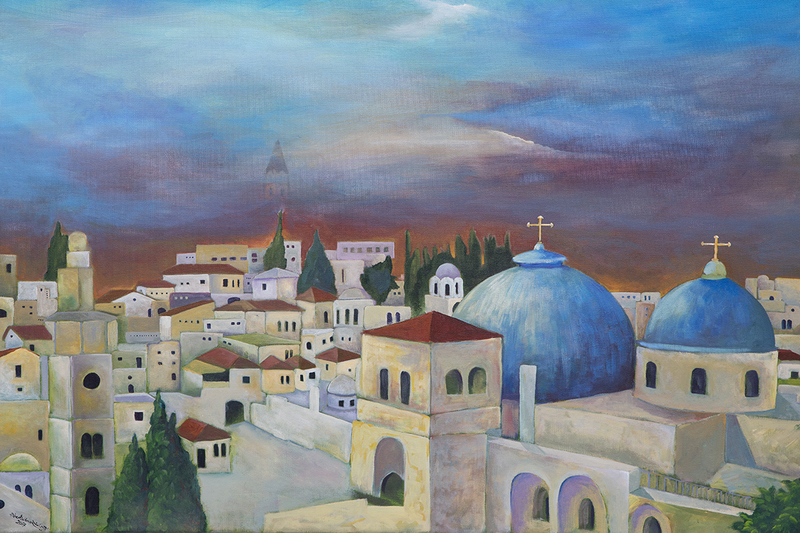 This brightly coloured original painting depicts the Jerusalem skyline over the Old City on a cloudy day with the Church of the Holy Sepulchre to the fore and the tower of St Saviour in the background. An innovator who dares to explore new art forms, Ahed’s tall figure is a familiar sight walking around the Old City with his camera. He is an accomplished freelance photographer and artist who co-founded the Jerusalem Art Lab, a space for artists that also offers training to inspire the next generation of artists and photographers. Demonstrating skills in a wide spectrum of mediums, Ahed’s art work draws inspiration from his home city of Jerusalem, often focusing on children and their innocence.